Kovalam India is situated 16 kms from Thiruvanantapuram, the capital city of Kerala State. Kovalam India was once a quiet fishing village, but today this beach town on the Arabian Sea, filled with coconut trees that swam gently in the cool breeze, is one of the most sought after destinations in South India, . 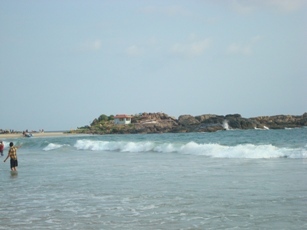 The beaches at Kovalam are divided into 3 parts, the northern beach, middle beach and southern or light house beach. They are more popularly known as Lighthouse Beach, Hawah Beach and Samudra Beach. The rocks on the silvery sands are those extending into the sea make charming formations from where the mesmerizing view of sun setting and sun rising for the shimmering blues of the ocean can be watched at this beautiful beach town in India. It has been a favourite haunt of tourists since the 1930s. Samudra Beach does not attract many tourists, and more local fishermen ply their trade here. The tourists can get involved in water sports, sunbathing and swimming, those who are interested in seeing the historical monuments, can be located in the vicinity of the beach. This mesmerizing beach can be visited throughout the year. The best time to visit is October to March and for the ayurvedic treatments from June to December, at the Beach Resorts Kovalam. The other places to visit nearby are Vizhinjam, a seaport, is about 3 km away and famous for its special varieties of fish, old Hindu temples, big churches and a mosque. By Air : Thiruvananthapuram is the nearest Airport, 16 kms away, which is an international Airport. Thiruvananthapuram is the nearest Railway station. If you want to get more details about this beach you can find it here at Wiki. The other places to visit nearby Kovalam beach are the interesting places at Thiruvananthapuram, which is just 16 kms away, where you can visit places like Napier Museum, the Sri Chitra Art Gallery and the Padmanabhaswamy Temple and the SMSM Institute, a State owned handicrafts emporium, to pick up some souvenirs.